This article is about the chemical element. For other uses, see Chromium (disambiguation). Ferrochromium alloy is commercially produced from chromite by silicothermic or aluminothermic reactions and chromium metal by roasting and leaching processes followed by reduction with carbon and then aluminium. Chromium metal is of high value for its high corrosion resistance and hardness. A major development in steel production was the discovery that steel could be made highly resistant to corrosion and discoloration by adding metallic chromium to form stainless steel. Stainless steel and chrome plating (electroplating with chromium) together comprise 85% of the commercial use. In the United States, trivalent chromium (Cr(III)) ion is considered an essential nutrient in humans for insulin, sugar and lipid metabolism. However, in 2014, the European Food Safety Authority, acting for the European Union, concluded that there was not sufficient evidence for chromium to be recognized as essential. While chromium metal and Cr(III) ions are not considered toxic, hexavalent chromium (Cr(VI)) is both toxic and carcinogenic. Abandoned chromium production sites often require environmental cleanup. Chromium is the first element in the 3d series where the 3d electrons start to sink into the inert core; they thus contribute less to metallic bonding, and hence the melting and boiling points and the enthalpy of atomisation of chromium are lower than those of the preceding element vanadium. Chromium(VI) is a strong oxidising agent in contrast to the molybdenum(VI) and tungsten(VI) oxides. Chromium is extremely hard, and is the third hardest element behind carbon (diamond) and boron. Its Mohs hardness is 8.5, which means that it can scratch samples of quartz and topaz, but can be scratched by corundum. Chromium is highly resistant to tarnishing, which makes it useful as a metal that preserves its outermost layer from corroding, unlike other metals such as copper, magnesium, and aluminium. Chromium has a melting point of 1907 °C (3465 °F), which is relatively low compared to the majority of transition metals. However, it still has the second highest melting point out of all the Period 4 elements, being topped by vanadium by 3 °C (5 °F) at 1910 °C (3470 °F). The boiling point of 2671 °C (4840 °F), however, is comparatively lower, having the third lowest boiling point out of the Period 4 transition metals alone[a] behind manganese and zinc. Chromium has an unusually high specular reflection in comparison to that of other transition metals. At 425 μm, chromium was found to have a relative maximum reflection of about 72% reflectance, before entering a depression in reflectivity, reaching a minimum of 62% reflectance at 750 μm before rising again to reflecting roughly 90% of 4000 μm of infrared waves.. When chromium is formed into a stainless steel alloy and polished, the specular reflection decreases with the inclusion of additional metals, yet is still rather high in comparison with other alloys. Between 40% and 60% of the visible spectrum is reflected from polished stainless steel. The explanation on why chromium displays such a high turnout of reflected photon waves in general, especially the 90% of infrared waves that were reflected, can be attributed to chromium's magnetic properties. Chromium has unique magnetic properties in the sense that chromium is the only elemental solid which shows antiferromagnetic ordering at room temperature (and below). Above 38 °C, its magnetic ordering changes to paramagnetic.. The antiferromagnetic properties, which cause the chromium atoms to temporarily ionize and bond with themselves, are present because the body-centric cubic's magnetic properties are disproportionate to the lattice periodicity. This is due to the fact that the magnetic moments at the cube's corners and the cube centers are not equal, but are still antiparallel. From here, the frequency-dependent relative permittivity of chromium, deriving from Maxwell's equations in conjunction with chromium's antiferromagnetivity, leaves chromium with a high infrared and visible light reflectance. Chromium metal left standing in air is passivated by oxidation, forming a thin, protective, surface layer. This layer is a spinel structure only a few molecules thick. It is very dense, and prevents the diffusion of oxygen into the underlying metal. This is different from the spongy oxide that forms on iron and carbon steel, through which elemental oxygen continues to migrate, reaching the underlying material to cause continued further rusting. Passivation can be enhanced by short contact with oxidizing acids like nitric acid. Passivated chromium is stable against acids. Passivation can be removed with a strong reducing agent that destroys the protective oxide layer on the metal. Chromium metal treated in this way readily dissolves in weak acids. Chromium, unlike such metals as iron and nickel, does not suffer from hydrogen embrittlement. However, it does suffer from nitrogen embrittlement, reacting with nitrogen from air and forming brittle nitrides at the high temperatures necessary to work the metal parts. Naturally occurring chromium is composed of three stable isotopes; 52Cr, 53Cr and 54Cr, with 52Cr being the most abundant (83.789% natural abundance). 19 radioisotopes have been characterized, with the most stable being 50Cr with a half-life of (more than) 1.8×1017 years, and 51Cr with a half-life of 27.7 days. All of the remaining radioactive isotopes have half-lives that are less than 24 hours and the majority less than 1 minute. Chromium also has two metastable nuclear isomers. 53Cr is the radiogenic decay product of 53Mn (half-life = 3.74 million years). Chromium isotopes are typically collocated (and compounded) with manganese isotopes. This circumstance is useful in isotope geology. Manganese-chromium isotope ratios reinforce the evidence from 26Al and 107Pd concerning the early history of the solar system. Variations in 53Cr/52Cr and Mn/Cr ratios from several meteorites indicate an initial 53Mn/55Mn ratio that suggests Mn-Cr isotopic composition must result from in-situ decay of 53Mn in differentiated planetary bodies. Hence 53Cr provides additional evidence for nucleosynthetic processes immediately before coalescence of the solar system. The isotopes of chromium range in atomic mass from 43 u (43Cr) to 67 u (67Cr). The primary decay mode before the most abundant stable isotope, 52Cr, is electron capture and the primary mode after is beta decay. 53Cr has been posited as a proxy for atmospheric oxygen concentration. Chromium is a member of group 6, of the transition metals. Chromium(0) has an electron configuration of [Ar]3d54s1, owing to the lower energy of the high spin configuration. Chromium exhibits a wide range of oxidation states, but chromium being ionized into a cation with a positive 3 charge serves as chromium's most stable ionic state. The +3 and +6 states occur the most commonly within chromium compounds; charges of +1, +4 and +5 for chromium are rare, but do nevertheless occasionally exist. 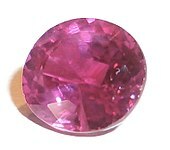 in corundum (aluminium oxide, Al2O3), pink sapphire or red-colored ruby is formed, depending on the amount of chromium. Chromium(III) tends to form octahedral complexes. Commercially available chromium(III) chloride hydrate is the dark green complex [CrCl2(H2O)4]Cl. Closely related compounds are the pale green [CrCl(H2O)5]Cl2 and violet [Cr(H2O)6]Cl3. If water-free green chromium(III) chloride is dissolved in water, the green solution turns violet after some time as the chloride in the inner coordination sphere is replaced by water. This kind of reaction is also observed with solutions of chrome alum and other water-soluble chromium(III) salts.
. It is dehydrated by heating to form the green chromium(III) oxide (Cr2O3), a stable oxide with a crystal structure identical to that of corundum. Sodium chromate is produced industrially by the oxidative roasting of chromite ore with calcium or sodium carbonate. The change in equilibrium is visible by a change from yellow (chromate) to orange (dichromate), such as when an acid is added to a neutral solution of potassium chromate. At yet lower pH values, further condensation to more complex oxyanions of chromium is possible. 3, the acid anhydride of chromic acid, is sold industrially as "chromic acid". It can be produced by mixing sulfuric acid with dichromate, and is a strong oxidizing agent. The oxidation state +5 is only realized in few compounds but are intermediates in many reactions involving oxidations by chromate. The only binary compound is the volatile chromium(V) fluoride (CrF5). This red solid has a melting point of 30 °C and a boiling point of 117 °C. It can be prepared by treating chromium metal with fluorine at 400 °C and 200 bar pressure. The peroxochromate(V) is another example of the +5 oxidation state. Potassium peroxochromate (K3[Cr(O2)4]) is made by reacting potassium chromate with hydrogen peroxide at low temperatures. This red brown compound is stable at room temperature but decomposes spontaneously at 150–170 °C. 3) with the corresponding halogen at elevated temperatures. Such compounds are susceptible to disproportionation reactions and are not stable in water. 4. 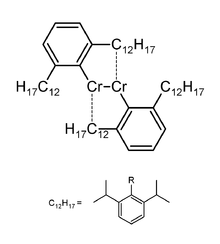 Many chromous carboxylates are known as well, the most famous of these being the red chromium(II) acetate (Cr2(O2CCH3)4) that features a quadruple bond. Most chromium(I) compounds are obtained solely by oxidation of electron-rich, octahedral chromium(0) complexes. Other chromium(I) complexes contain cyclopentadienyl ligands. As verified by X-ray diffraction, a Cr-Cr quintuple bond (length 183.51(4) pm) has also been described. Extremely bulky monodentate ligands stabilize this compound by shielding the quintuple bond from further reactions. Many chromium(0) compounds are currently known; however, most of these compounds are derivatives of the compounds chromium hexacarbonyl or bis(benzene)chromium. Chromium is the 13th most abundant element in Earth's crust with an average concentration of 100 ppm. Chromium compounds are found in the environment from the erosion of chromium-containing rocks, and can be redistributed by volcanic eruptions. Typical background concentrations of chromium in environmental media are: atmosphere <10 ng m−3; soil <500 mg kg−1; vegetation <0.5 mg kg−1; freshwater <10 μg L−1; seawater <1 μg L−1; sediment <80 mg kg−1. Chromium is mined as chromite (FeCr2O4) ore.
About two-fifths of the chromite ores and concentrates in the world are produced in South Africa, about a third in Kazakhstan, while India, Russia, and Turkey are also substantial producers. Untapped chromite deposits are plentiful, but geographically concentrated in Kazakhstan and southern Africa. Although rare, deposits of native chromium exist. The Udachnaya Pipe in Russia produces samples of the native metal. This mine is a kimberlite pipe, rich in diamonds, and the reducing environment helped produce both elemental chromium and diamonds. The relation between Cr(III) and Cr(VI) strongly depends on pH and oxidative properties of the location. In most cases, Cr(III) is the dominating species, but in some areas, the ground water can contain up to 39 µg/liter of total chromium of which 30 µg/liter is Cr(VI). Chromium was first discovered as an element after it came to the attention of the Western world in the red crystalline mineral crocoite (which is lead(II) chromate). This mineral was discovered in 1761 and was initially used as a pigment; the distinctive color was attributed to the chromium from within the crocoite. In present day, nearly all chromium is commercially extracted from the only viable ore for extensiveness and predicted long term use, being chromite, which is iron chromium oxide (FeCr2O4); chromite is now the principal source of chromium for use in pigments. Weapons found in burial pits dating from the late 3rd century B.C. Qin Dynasty of the Terracotta Army near Xi'an, China, have been analyzed by archaeologists. Although these weapons were presumably buried more than two millennia ago, the ancient bronze tips of both the swords and crossbow bolts found at the site showed unexpectedly little corrosion, possibly because the bronze was deliberately coated with a thin layer of chromium oxide. Still, this oxide layer that was found on the weapons was not pure chromium metal or chrome plating as it is commonly produced today, but a mere 10-15 μm layer of chromium oxide molecules at up to 2% chromium was discovered, which turned out to be enough to protect the bronze from corroding. Chromium minerals as pigments came to the attention of the west in the 18th century. On 26 July 1761, Johann Gottlob Lehmann found an orange-red mineral in the Beryozovskoye mines in the Ural Mountains which he named Siberian red lead. Though misidentified as a lead compound with selenium and iron components, the mineral was in fact crocoite (or lead(II) chromate) with a formula of PbCrO4. In 1770, Peter Simon Pallas visited the same site as Lehmann and found a red lead mineral that was discovered to possess useful properties as a pigment in paints. After Pallas, the use of Siberian red lead as a paint pigment began to develop rapidly throughout the region. The red color of rubies is from a trace amount of chromium. In 1794, Louis Nicolas Vauquelin received samples of crocoite ore. He produced chromium trioxide (CrO3) by mixing crocoite with hydrochloric acid. In 1797, Vauquelin discovered that he could isolate metallic chromium by heating the oxide in a charcoal oven, for which he is credited as the one who truly discovered the element. Vauquelin was also able to detect traces of chromium in precious gemstones, such as ruby or emerald. During the 19th century, chromium was primarily used not only as a component of paints, but in tanning salts as well. For quite some time, the crocoite found in Russia was the main source for such tanning materials. In 1827, a larger chromite deposit was discovered near Baltimore, United States, which quickly met the demand for tanning salts much more adequately than the crocoite that had been used previously. 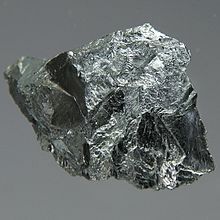 This made the United States the largest producer of chromium products until the year 1848, when larger deposits of chromite were uncovered near the city of Bursa, Turkey. Chromium is also famous for its reflective, metallic luster when polished. It is used as a protective and decorative coating on car parts, plumbing fixtures, furniture parts and many other items, usually applied by electroplating. Chromium was used for electroplating as early as 1848, but this use only became widespread with the development of an improved process in 1924. Approximately 28.8 million metric tons (Mt) of marketable chromite ore was produced in 2013, and converted into 7.5 Mt of ferrochromium. According to John F. Papp, writing for the USGS, "Ferrochromium is the leading end use of chromite ore, [and] stainless steel is the leading end use of ferrochromium." The largest producers of chromium ore in 2013 have been South Africa (48%), Kazakhstan (13%), Turkey (11%), India (10%) with several other countries producing the rest of about 18% of the world production. The two main products of chromium ore refining are ferrochromium and metallic chromium. For those products the ore smelter process differs considerably. For the production of ferrochromium, the chromite ore (FeCr2O4) is reduced in large scale in electric arc furnace or in smaller smelters with either aluminium or silicon in an aluminothermic reaction. For the production of pure chromium, the iron must be separated from the chromium in a two step roasting and leaching process. The chromite ore is heated with a mixture of calcium carbonate and sodium carbonate in the presence of air. The chromium is oxidized to the hexavalent form, while the iron forms the stable Fe2O3. The subsequent leaching at higher elevated temperatures dissolves the chromates and leaves the insoluble iron oxide. The chromate is converted by sulfuric acid into the dichromate. The dichromate is converted to the chromium(III) oxide by reduction with carbon and then reduced in an aluminothermic reaction to chromium. The creation of metal alloys account for 85% of the available chromium's usage. The remainder of chromium is used in the chemical, refractory, and foundry industries. Stainless steel cutlery made from Cromargan 18/10, containing 18% chromium. The strengthening effect of forming stable metal carbides at the grain boundaries and the strong increase in corrosion resistance made chromium an important alloying material for steel. The high-speed tool steels contain between 3 and 5% chromium. Stainless steel, the primary corrosion-resistant metal alloy, is formed when chromium is introduced to iron in sufficient concentrations, usually where the chromium concentration is above 11%. For stainless steel's formation, ferrochromium is added to the molten iron. Also, nickel-based alloys increase in strength due to the formation of discrete, stable metal carbide particles at the grain boundaries. For example, Inconel 718 contains 18.6% chromium. Because of the excellent high-temperature properties of these nickel superalloys, they are used in jet engines and gas turbines in lieu of common structural materials. Decorative chrome plating on a motorcycle. The relative high hardness and corrosion resistance of unalloyed chromium makes chrome a reliable metal for surface coating; it is still the most popular metal for sheet coating with its above average durability compared to other coating metals. A layer of chromium is deposited on pretreated metallic surfaces by electroplating techniques. There are two deposition methods: thin and thick. Thin deposition involves a layer of chromium below 1 µm thickness deposited by chrome plating, and is used for decorative surfaces. Thicker chromium layers are deposited if wear-resistant surfaces are needed. Both methods use acidic chromate or dichromate solutions. To prevent the energy-consuming change in oxidation state, the use of chromium(III) sulfate is under development; for most applications of chromium, the previously established process is used. In the chromate conversion coating process, the strong oxidative properties of chromates are used to deposit a protective oxide layer on metals like aluminium, zinc and cadmium. This passivation and the self-healing properties by the chromate stored in the chromate conversion coating, which is able to migrate to local defects, are the benefits of this coating method. Because of environmental and health regulations on chromates, alternative coating methods are under development. Chromic acid anodizing (or Type I anodizing) of aluminium is another electrochemical process, which does not lead to the deposition of chromium, but uses chromic acid as electrolyte in the solution. During anodization, an oxide layer is formed on the aluminium. The use of chromic acid, instead of the normally used sulfuric acid, leads to a slight difference of these oxide layers. The high toxicity of Cr(VI) compounds, used in the established chromium electroplating process, and the strengthening of safety and environmental regulations demand a search for substitutes for chromium or at least a change to less toxic chromium(III) compounds. The mineral crocoite (which is also lead chromate PbCrO4) was used as a yellow pigment shortly after its discovery. After a synthesis method became available starting from the more abundant chromite, chrome yellow was, together with cadmium yellow, one of the most used yellow pigments. The pigment does not photodegrade, but it tends to darken due to the formation of chromium(III) oxide. It has a strong color, and was used for school buses in the United States and for the Postal Service (for example, the Deutsche Post) in Europe. The use of chrome yellow has since declined due to environmental and safety concerns and was replaced by organic pigments or other alternatives that are free from lead and chromium. Other pigments that are based around chromium are, for example, the deep shade of red pigment chrome red, which is simply lead chromate with lead(II) hydroxide (PbCrO4·Pb(OH)2). A very important chromate pigment, which was used widely in metal primer formulations, was zinc chromate, now replaced by zinc phosphate. A wash primer was formulated to replace the dangerous practice of pre-treating aluminium aircraft bodies with a phosphoric acid solution. This used zinc tetroxychromate dispersed in a solution of polyvinyl butyral. An 8% solution of phosphoric acid in solvent was added just before application. It was found that an easily oxidized alcohol was an essential ingredient. A thin layer of about 10–15 µm was applied, which turned from yellow to dark green when it was cured. There is still a question as to the correct mechanism. Chrome green is a mixture of Prussian blue and chrome yellow, while the chrome oxide green is chromium(III) oxide. Chromium oxides are also used as a green pigment in the field of glassmaking and also as a glaze for ceramics. Green chromium oxide is extremely lightfast and as such is used in cladding coatings. It is also the main ingredient in infrared reflecting paints, used by the armed forces to paint vehicles and to give them the same infrared reflectance as green leaves. Natural rubies are corundum (aluminum oxide) crystals that are colored red (the rarest type) due to chromium (III) ions (other colors of corundum gems are termed sapphires). A red-colored artificial ruby may also be achieved by doping chromium(III) into artificial corundum crystals, thus making chromium a requirement for making synthetic rubies. Such a synthetic ruby crystal was the basis for the first laser, produced in 1960, which relied on stimulated emission of light from the chromium atoms in such a crystal. A ruby laser is lasing at 694.3 nanometers, in a deep red color. Because of their toxicity, chromium(VI) salts are used for the preservation of wood. For example, chromated copper arsenate (CCA) is used in timber treatment to protect wood from decay fungi, wood-attacking insects, including termites, and marine borers. The formulations contain chromium based on the oxide CrO3 between 35.3% and 65.5%. In the United States, 65,300 metric tons of CCA solution were used in 1996. Chromium(III) salts, especially chrome alum and chromium(III) sulfate, are used in the tanning of leather. The chromium(III) stabilizes the leather by cross linking the collagen fibers. Chromium tanned leather can contain between 4 and 5% of chromium, which is tightly bound to the proteins. Although the form of chromium used for tanning is not the toxic hexavalent variety, there remains interest in management of chromium in the tanning industry. Recovery and reuse, direct/indirect recycling, use of less chromium, or "chrome-less" tanning are practiced to better manage chromium in tanning. Several chromium compounds are used as catalysts for processing hydrocarbons. For example, the Phillips catalyst, prepared from chromium oxides, is used for the production of about half the world's polyethylene. Fe-Cr mixed oxides are employed as high-temperature catalysts for the water gas shift reaction. Copper chromite is a useful hydrogenation catalyst. Chromium(IV) oxide (CrO2) is a magnetic compound. Its ideal shape anisotropy, which imparts high coercivity and remnant magnetization, made it a compound superior to γ-Fe2O3. Chromium(IV) oxide is used to manufacture magnetic tape used in high-performance audio tape and standard audio cassettes. Chromates are added to drilling muds to prevent corrosion of steel under wet conditions. Chromium(III) oxide (Cr2O3) is a metal polish known as green rouge. Chromic acid is a powerful oxidizing agent and is a useful compound for cleaning laboratory glassware of any trace of organic compounds. It is prepared by dissolving potassium dichromate in concentrated sulfuric acid, which is then used to wash the apparatus. Sodium dichromate is sometimes used because of its higher solubility (50 g/L versus 200 g/L respectively). The use of dichromate cleaning solutions is now phased out due to the high toxicity and environmental concerns. Modern cleaning solutions are highly effective and chromium free. Potassium dichromate is a chemical reagent, used as a titrating agent. Chrome alum is Chromium(III) potassium sulfate and is used as a mordant (i.e., a fixing agent) for dyes in fabric and in tanning. The biologically beneficial effects of Chromium(III) continue to be debated. Some experts believe that they reflect pharmacological rather than nutritional responses, while others suggest that they are side effects of a toxic metal. The discussion is marred by elements of negativity and occasionally becomes acrimonious. Chromium is accepted by the U.S. National Institutes of Health as a trace element for its roles in the action of insulin, a hormone critical to the metabolism and storage of carbohydrate, fat and protein. The precise mechanism of its actions in the body, however, have not been fully defined, leaving in question whether chromium is essential for healthy people. In contrast, hexavalent chromium (Cr(VI) or Cr6+) is highly toxic and mutagenic when inhaled. Ingestion of chromium(VI) in water has been linked to stomach tumors, and it may also cause allergic contact dermatitis (ACD). Chromium deficiency, involving a lack of Cr(III) in the body, or perhaps some complex of it, such as glucose tolerance factor is controversial. Some studies suggest that the biologically active form of chromium (III) is transported in the body via an oligopeptide called low-molecular-weight chromium-binding substance (LMWCr), which might play a role in the insulin signaling pathway. Chromium content of common foods is generally low (1-13 micrograms per serving). Chromium content of food varies widely due to differences in soil mineral content, growing season, plant cultivar, and contamination during processing. In addition, chromium (and nickel) leach into food cooked in stainless steel, with the effect largest when the cookware is new. Acidic foods such as tomato sauce which are cooked for many hours also exacerbate this effect. There is disagreement on chromium's status as an essential nutrient. Governmental departments from Australia, New Zealand, India, Japan and the United States consider chromium essential while the European Food Safety Authority (EFSA), representing the European Union, does not. The National Academy of Medicine (NAM) updated the Estimated Average Requirements (EARs) and the Recommended Dietary Allowances (RDAs) for chromium in 2001. For chromium, there was not sufficient information to set EARs and RDAs, so its needs are described as estimates for Adequate Intakes (AIs). The current AIs of chromium for women ages 14 through 50 is 25 μg/day, and the AIs for women ages 50 and above is 20 μg/day. The AIs for women who are pregnant are 30 μg/day, and for women who are lactating, the set AIs are 45 μg/day. The AIs for men ages 14 through 50 are 35 μg/day, and the AIs for men ages 50 and above are 30 μg/day. For children ages 1 through 13, the AIs increase with age from 0.2 μg/day up to 25 μg/day. As for safety, the NAM sets Tolerable Upper Intake Levels (ULs) for vitamins and minerals when the evidence is sufficient. In the case of chromium, there is not yet enough information and hence no UL has been established. Collectively, the EARs, RDAs, AIs and ULs are the parameters for the nutrition recommendation system known as Dietary Reference Intake (DRI). Australia and New Zealand consider chromium to be an essential nutrient, with an AI of 35 μg/day for men, 25 μg/day for women, 30 μg/day for women who are pregnant, and 45 μg/day for women who are lactating. A UL has not been set due to the lack of sufficient data. India considers chromium to be an essential nutrient, with an adult recommended intake of 33 μg/day. Japan also considers chromium to be an essential nutrient, with an AI of 10 μg/day for adults, including women who are pregnant or lactating. A UL has not been set. The EFSA of the European Union however, does not consider chromium to be an essential nutrient; chromium is the only mineral for which the United States and the European Union disagree. For the United States' food and dietary supplement labeling purposes, the amount of the substance in a serving is expressed as a percent of the Daily Value (%DV). For chromium labeling purposes, 100% of the Daily Value was 120 μg. As of May 27, 2016, the percentage of daily value was revised to 35 μg to bring the chromium intake into a consensus with the official Recommended Dietary Allowance. The original deadline to be in compliance was July 28, 2018, but on September 29, 2017 the Food and Drug Administration released a proposed rule that extended the deadline to January 1, 2020 for large companies and January 1, 2021 for small companies. Food composition databases such as the those maintained by the U.S. Department of Agriculture do not contain information on the chromium content of foods. A wide variety of animal-sourced and vegetable-sourced foods contain chromium. Content per serving is influenced by the chromium content of the soil in which the plants are grown and by feedstuffs fed to animals; also by processing methods, as chromium is leached into foods if processed or cooked in chromium-containing stainless steel equipment. One diet analysis study conducted in Mexico reported an average daily chromium intake of 30 micrograms. An estimated 31% of adults in the United States consume multi-vitamin/mineral dietary supplements which often contain 25 to 60 micrograms of chromium. Chromium is an ingredient in total parenteral nutrition (TPN) because deficiency can occur after months of intravenous feeding with chromium-free TPN. For this reason, chromium is added to TPN solutions, along with other trace minerals. It is also in nutritional products for preterm infants. Although the mechanism in biological roles for chromium is unclear, in the United States chromium-containing products are sold as non-prescription dietary supplements in amounts ranging from 50 to 1,000 μg. Lower amounts of chromium are also often incorporated into multi-vitamin/mineral supplements consumed by an estimated 31% of adults in the United States. Chemical compounds used in dietary supplements include chromium chloride, chromium citrate, chromium(III) picolinate, chromium(III) polynicotinate, and other chemical compositions. The benefit of supplements has not been proven. In 2005, the U.S. Food and Drug Administration had approved a Qualified Health Claim for chromium picolinate with a requirement for very specific label wording: "One small study suggests that chromium picolinate may reduce the risk of insulin resistance, and therefore possibly may reduce the risk of type 2 diabetes. FDA concludes, however, that the existence of such a relationship between chromium picolinate and either insulin resistance or type 2 diabetes is highly uncertain." At the same time, in answer to other parts of the petition, the FDA rejected claims for chromium picolinate and cardiovascular disease, retinopathy or kidney disease caused be abnormally high blood sugar levels. In 2010, chromium(III) picolinate was approved by Health Canada to be used in dietary supplements. Approved labeling statements include: a factor in the maintenance of good health, provides support for healthy glucose metabolism, helps the body to metabolize carbohydrates and helps the body to metabolize fats. The European Food Safety Authority (EFSA) approved claims in 2010 that chromium contributed to normal macronutrient metabolism and maintenance of normal blood glucose concentration, but rejected claims for maintenance or achievement of a normal body weight, or reduction of tiredness or fatigue. Given the evidence for chromium deficiency causing problems with glucose management in the context of intravenous nutrition products formulated without chromium, research interest turned to whether chromium supplementation for people who have type 2 diabetes but are not chromium deficient could benefit. Looking at the results from four meta-analyses, one reported a statistically significant decrease in fasting plasma glucose levels (FPG) and a non-significant trend in lower hemoglobin A1C. A second reported the same, a third reported significant decreases for both measures, while a fourth reported no benefit for either. A review published in 2016 listed 53 randomized clinical trials that were included in one or more of six meta-analyses. It concluded that whereas there may be modest decreases in FPG and/or HbA1C that achieve statistical significance in some of these meta-analyses, few of the trials achieved decreases large enough to be expected to be relevant to clinical outcome. Two systematic reviews looked at chromium supplements as a mean of managing body weight in overweight and obese people. One, limited to chromium picolinate, a popular supplement ingredient, reported a statistically significant -1.1 kg (2.4 lb) weight loss in trials longer than 12 weeks. The other included all chromium compounds and reported a statistically significant -0.50 kg (1.1 lb) weight change. Change in percent body fat did not reach statistical significance. Authors of both reviews considered the clinical relevance of this modest weight loss as uncertain/unreliable. The European Food Safety Authority reviewed the literature and concluded that there was insufficient evidence to support a claim. Chromium is promoted as a sports performance dietary supplement, based on the theory that it potentiated insulin activity, with anticipated results of increased muscle mass, and faster recovery of glycogen storage during post-exercise recovery. A review of clinical trials reported that chromium supplementation did not improve exercise performance or increase muscle strength. The International Olympic Committee reviewed dietary supplements for high-performance athletes in 2018 and concluded there was no need to increase chromium intake for athletes, nor support for claims of losing body fat. Chromium is naturally present in the environment in trace amounts, but industrial use in rubber and stainless steel manufacturing, chrome plating, dyes for textiles, tanneries and other uses contaminates aquatic systems. In Bangladesh, rivers in or downstream from industrialized areas exhibit heavy metal contamination. Irrigation water standards for chromium are 0.1 mg/L, but some rivers are more than five times that amount. The standard for fish for human consumption is less than 1 mg/kg, but many tested samples were more than five times that amount. Chromium, especially hexavalent chromium, is highly toxic to fish because it is easily absorbed across the gills, readily enters blood circulation, crosses cell membranes and bioconcentrates up the food chain. In contrast, the toxicity of trivalent chromium is very low, attributed to poor membrane permeability and little biomagnification. Acute and chronic exposure to chromium(VI) affect fish behavior, physiology, reproduction and survival. Hyperactivity and erratic swimming have been reported in contaminated environments. Egg hatching and fingerling survival are affected. In adult fish there are reports of histopathological damage to liver, kidney, muscle, intestines, and gills. Mechanisms include mutagenic gene damage and disruptions of enzyme functions. There is evidence that fish may not require chromium, but benefit from a measured amount in diet. In one study, juvenile fish gained weight on a zero chromium diet, but the addition of 500 μg of chromium in the form of chromium chloride or other supplement types, per kilogram of food (dry weight), increased weight gain. At 2,000 μg/kg the weight gain was no better than with the zero chromium diet, and there were increased DNA strand breaks. Water-insoluble chromium(III) compounds and chromium metal are not considered a health hazard, while the toxicity and carcinogenic properties of chromium(VI) have been known for a long time. Because of the specific transport mechanisms, only limited amounts of chromium(III) enter the cells. Acute oral toxicity ranges between 1.5 and 3.3 mg/kg. A 2008 review suggested that moderate uptake of chromium(III) through dietary supplements poses no genetic-toxic risk. In the US, the Occupational Safety and Health Administration (OSHA) has designated an air permissible exposure limit (PEL) in the workplace as a time-weighted average (TWA) of 1 mg/m3. The National Institute for Occupational Safety and Health (NIOSH) has set a recommended exposure limit (REL) of 0.5 mg/m3, time-weighted average. The IDLH (immediately dangerous to life and health) value is 250 mg/m3. The acute oral toxicity for chromium(VI) ranges between 50 and 150 mg/kg. In the body, chromium(VI) is reduced by several mechanisms to chromium(III) already in the blood before it enters the cells. The chromium(III) is excreted from the body, whereas the chromate ion is transferred into the cell by a transport mechanism, by which also sulfate and phosphate ions enter the cell. The acute toxicity of chromium(VI) is due to its strong oxidant properties. After it reaches the blood stream, it damages the kidneys, the liver and blood cells through oxidation reactions. Hemolysis, renal, and liver failure result. Aggressive dialysis can be therapeutic. The carcinogenity of chromate dust has been known for a long time, and in 1890 the first publication described the elevated cancer risk of workers in a chromate dye company. Three mechanisms have been proposed to describe the genotoxicity of chromium(VI). The first mechanism includes highly reactive hydroxyl radicals and other reactive radicals which are by products of the reduction of chromium(VI) to chromium(III). The second process includes the direct binding of chromium(V), produced by reduction in the cell, and chromium(IV) compounds to the DNA. The last mechanism attributed the genotoxicity to the binding to the DNA of the end product of the chromium(III) reduction. Chromium salts (chromates) are also the cause of allergic reactions in some people. Chromates are often used to manufacture, amongst other things, leather products, paints, cement, mortar and anti-corrosives. Contact with products containing chromates can lead to allergic contact dermatitis and irritant dermatitis, resulting in ulceration of the skin, sometimes referred to as "chrome ulcers". This condition is often found in workers that have been exposed to strong chromate solutions in electroplating, tanning and chrome-producing manufacturers. Because chromium compounds were used in dyes, paints, and leather tanning compounds, these compounds are often found in soil and groundwater at active and abandoned industrial sites, needing environmental cleanup and remediation. Primer paint containing hexavalent chromium is still widely used for aerospace and automobile refinishing applications. In 2010, the Environmental Working Group studied the drinking water in 35 American cities in the first nationwide study. The study found measurable hexavalent chromium in the tap water of 31 of the cities sampled, with Norman, Oklahoma, at the top of list; 25 cities had levels that exceeded California's proposed limit. ^ Most common oxidation states of chromium are in bold. The right column lists a representative compound for each oxidation state. ^ a b Fawcett, Eric (1988). "Spin-density-wave antiferromagnetism in chromium". Reviews of Modern Physics. 60: 209. Bibcode:1988RvMP...60..209F. doi:10.1103/RevModPhys.60.209. ^ Brandes, EA; Greenaway, HT; Stone, HEN (1956). "Ductility in Chromium". Nature. 178 (4533): 587. Bibcode:1956Natur.178..587B. doi:10.1038/178587a0. ^ a b c Coblentz, WW; Stair, R. "Reflecting power of beryllium, chromium, and several other metals" (PDF). National Institute of Standards and Technology. NIST Publications. Retrieved 11 October 2018. ^ a b c d e f "Chromium". Office of Dietary Supplements, US National Institutes of Health. 2016. Retrieved 26 June 2016. ^ "Scientific Opinion on Dietary Reference Values for chromium". European Food Safety Authority. 18 September 2014. Retrieved 20 March 2018. ^ "The Nature of X-Ray Photoelectron Spectra". CasaXPS. Casa Software Ltd. 2005. Retrieved 10 March 2019. ^ Schwarz, W. H. Eugen (April 2010). "The Full Story of the Electron Configurations of the Transition Elements" (PDF). Journal of Chemical Education. 87 (4): 444–8. doi:10.1021/ed8001286. Retrieved 9 November 2018. ^ a b Lind, Michael Acton (1972). "The infrared reflectivity of chromium and chromium-aluminium alloys". Iowa State University Digital Repository. Iowa State University. Retrieved 4 November 2018. ^ Bos, Laurence William (1969). "Optical properties of chromium-manganese alloys". Iowa State University Digital Repository. Iowa State University. Retrieved 4 November 2018. ^ Wallwork, GR (1976). "The oxidation of alloys". Reports on Progress in Physics. 39 (5): 401–485. Bibcode:1976RPPh...39..401W. doi:10.1088/0034-4885/39/5/001. ^ a b c d e f g h Holleman, Arnold F; Wiber, Egon; Wiberg, Nils (1985). "Chromium". Lehrbuch der Anorganischen Chemie (in German) (91–100 ed.). Walter de Gruyter. pp. 1081–1095. ISBN 978-3-11-007511-3. ^ National Research Council (U.S.). Committee on Coatings (1970). High-temperature oxidation-resistant coatings: coatings for protection from oxidation of superalloys, refractory metals, and graphite. National Academy of Sciences. ISBN 978-0-309-01769-5. ^ "Live Chart of Nuclides". International Atomic Energy Agency - Nuclear Data Section. Retrieved 18 October 2018. ^ Birck, JL; Rotaru, M; Allegre, C (1999). "53Mn-53Cr evolution of the early solar system". Geochimica et Cosmochimica Acta. 63 (23–24): 4111–4117. Bibcode:1999GeCoA..63.4111B. doi:10.1016/S0016-7037(99)00312-9. ^ Frei, Robert; Gaucher, Claudio; Poulton, Simon W; Canfield, Don E (2009). "Fluctuations in Precambrian atmospheric oxygenation recorded by chromium isotopes". Nature. 461 (7261): 250–253. doi:10.1038/nature08266. PMID 19741707. ^ a b Kotaś, J; Stasicka, Z (2000). "Chromium occurrence in the environment and methods of its speciation". Environmental Pollution. 107 (3): 263–283. doi:10.1016/S0269-7491(99)00168-2. PMID 15092973. ^ Clark, Jim. "Oxidation states (oxidation numbers)". Chemguide. Retrieved 3 October 2018. ^ "Chromium(III) compounds". National Pollutant Inventory. Commonwealth of Australia. Retrieved 8 November 2018. ^ Assfalg, M; Banci, L; Bertini, I; Bruschi, M; Michel, C; Giudici-Orticoni, M; Turano, P (31 July 2002). "NMR structural characterization of the reduction of chromium(VI) to chromium(III) by cytochrome c7". Protein Data Bank (1LM2). doi:10.2210/pdb1LM2/pdb. Retrieved 8 November 2018. ^ Haxhillazi, Gentiana (2003). "Preparation, Structure and Vibrational Spectroscopy of Tetraperoxo Complexes of CrV+, VV+, NbV+ and TaV+". PhD thesis, University of Siegen. ^ Cotton, FA; Walton, RA (1993). Multiple Bonds Between Metal Atoms. Oxford: Oxford University Press. ISBN 978-0-19-855649-7. ^ Nguyen, T; Sutton, AD; Brynda, M; Fettinger, JC; Long, GJ; Power, PP (2005). "Synthesis of a stable compound with fivefold bonding between two chromium(I) centers". Science. 310 (5749): 844–847. doi:10.1126/science.1116789. PMID 16179432. ^ National Center for Biotechnology Information. "Chromium carbonyl". PubChem. National Institute for Health. Retrieved 1 October 2018. ^ Emsley, John (2001). "Chromium". Nature's Building Blocks: An A-Z Guide to the Elements. Oxford, England, UK: Oxford University Press. pp. 495–498. ISBN 978-0-19-850340-8. ^ John Rieuwerts (14 July 2017). The Elements of Environmental Pollution. Taylor & Francis. ISBN 978-1-135-12679-7. ^ a b c National Research Council (U.S.). Committee on Biologic Effects of Atmospheric Pollutants (1974). Chromium. National Academy of Sciences. ISBN 978-0-309-02217-0. ^ Champion, Marc (11 Jan 2018). "How a Trump SoHo Partner Ended Up With Toxic Mining Riches From Kazakhstan". Bloomberg L.P. Retrieved 21 Jan 2018. ^ a b c d Papp, John F. "Mineral Yearbook 2015: Chromium" (PDF). United States Geological Survey. Retrieved 3 June 2015. ^ Fleischer, Michael (1982). "New Mineral Names" (PDF). American Mineralogist. 67: 854–860. ^ Gonzalez, AR; Ndung'u, K; Flegal, AR (2005). "Natural Occurrence of Hexavalent Chromium in the Aromas Red Sands Aquifer, California". Environmental Science and Technology. 39 (15): 5505–5511. Bibcode:2005EnST...39.5505G. doi:10.1021/es048835n. PMID 16124280. ^ Casteran, Rene. "Chromite mining". Oregon Encyclopedia. Portland State University and the Oregon Historical Society. Retrieved 1 October 2018. ^ Cotterell, Maurice. (2004). The Terracotta Warriors: The Secret Codes of the Emperor's Army. Rochester: Bear and Company. ISBN 1-59143-033-X. Page 102. ^ Lorch, Mark (2 Feb 2016). "From chrome plating to nanotubes: the 'modern' chemistry first used in ancient times". The Conversation. The Conversation US Inc. Retrieved 19 October 2018. ^ Meyer, RJ (1962). Chrom : Teil A - Lieferung 1. Geschichtliches · Vorkommen · Technologie · Element bis Physikalische Eigenschaften (in German). Berlin, Heidelberg: Springer Berlin Heidelberg Imprint Springer. ISBN 978-3-662-11865-8. OCLC 913810356. ^ Lehmanni, Iohannis Gottlob (1766). De Nova Minerae Plumbi Specie Crystallina Rubra, Epistola. ^ a b c Guertin, Jacques; Jacobs, James Alan & Avakian, Cynthia P. (2005). Chromium (VI) Handbook. CRC Press. pp. 7–11. ISBN 978-1-56670-608-7. ^ Weeks, Mary Elvira (1932). "The discovery of the elements. V. Chromium, molybdenum, tungsten and uranium". Journal of Chemical Education. 9 (3): 459–73. doi:10.1021/ed009p459. ISSN 0021-9584. ^ Vauquelin, Louis Nicolas (1798). "Memoir on a New Metallic Acid which exists in the Red Lead of Siberia". Journal of Natural Philosophy, Chemistry, and the Arts. 3: 145–146. ^ Glenn, William (1895). "Chrome in the Southern Appalachian Region". 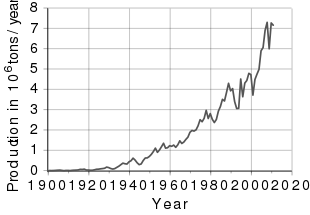 Transactions of the American Institute of Mining, Metallurgical and Petroleum Engineers. 25: 482. ^ van der Krogt, Peter. "Chromium". Retrieved 24 Aug 2008. ^ a b c Dennis, JK; Such, TE (1993). "History of Chromium Plating". Nickel and Chromium Plating. Woodhead Publishing. pp. 9–12. ISBN 978-1-85573-081-6. ^ a b c d Papp, John F. & Lipin, Bruce R. (2006). "Chromite". Industrial Minerals & Rocks: Commodities, Markets, and Uses (7th ed.). SME. ISBN 978-0-87335-233-8. ^ Papp, John F. "Mineral Yearbook 2002: Chromium" (PDF). United States Geological Survey. Retrieved 16 Feb 2009. ^ Morrison, RD; Murphy, BL (4 Aug 2010). Environmental Forensics: Contaminant Specific Guide. Academic Press. ISBN 9780080494784. ^ Davis, JR (2000). Alloy digest sourcebook : stainless steels (in Afrikaans). Materials Park, OH: ASM International. pp. 1–5. ISBN 978-0-87170-649-2. OCLC 43083287. ^ Bhadeshia, HK. "Nickel-Based Superalloys". University of Cambridge. Archived from the original on 25 August 2006. Retrieved 17 February 2009. ^ Breitsameter, M (2002-08-15). "Thermal Spraying versus Hard Chrome Plating". Azo Materials. AZoNetwork. Retrieved 1 October 2018. ^ Edwards, J (1997). Coating and Surface Treatment Systems for Metals. Finishing Publications Ltd. and ASMy International. pp. 66–71. ISBN 978-0-904477-16-0. ^ Zhao J, Xia L, Sehgal A, Lu D, McCreery RL, Frankel GS (2001). "Effects of chromate and chromate conversion coatings on corrosion of aluminum alloy 2024-T3". Surface and Coatings Technology. 140 (1): 51–57. doi:10.1016/S0257-8972(01)01003-9. hdl:1811/36519. Archived from the original on 20 July 2011. ^ Cotell, CM; Sprague, JA; Smidt, FA (1994). ASM Handbook: Surface Engineering. ASM International. ISBN 978-0-87170-384-2. Retrieved 17 Feb 2009. ^ Worobec, Mary Devine; Hogue, Cheryl (1992). Toxic Substances Controls Guide: Federal Regulation of Chemicals in the Environment. Washington, D.C.: BNA Books. p. 13. ISBN 978-0-87179-752-0. ^ Gettens, Rutherford John (1966). "Chrome yellow". Painting Materials: A Short Encyclopaedia. Courier Dover Publications. pp. 105–106. ISBN 978-0-486-21597-6. ^ Marrion, Alastair (2004). The chemistry and physics of coatings. Royal Society of Chemistry. pp. 287–. ISBN 978-0-85404-604-1. ^ Moss, SC; Newnham, RE (1964). "The chromium position in ruby" (PDF). Zeitschrift für Kristallographie. 120 (4–5): 359–363. Bibcode:1964ZK....120..359M. doi:10.1524/zkri.1964.120.4-5.359. ^ Webb, Colin E; Jones, Julian DC (2004). Handbook of Laser Technology and Applications: Laser design and laser systems. CRC Press. pp. 323–. ISBN 978-0-7503-0963-9. ^ a b Hingston, J; Collins, CD; Murphy, RJ; Lester, JN (2001). "Leaching of chromated copper arsenate wood preservatives: a review". Environmental Pollution. 111 (1): 53–66. doi:10.1016/S0269-7491(00)00030-0. PMID 11202715. ^ Brown, EM (1997). "A Conformational Study of Collagen as Affected by Tanning Procedures". Journal of the American Leather Chemists Association. 92: 225–233. ^ Sreeram, K.; Ramasami, T. (2003). "Sustaining tanning process through conservation, recovery and better utilization of chromium". Resources, Conservation and Recycling. 38 (3): 185–212. doi:10.1016/S0921-3449(02)00151-9. ^ Barnhart, Joel (1997). "Occurrences, Uses, and Properties of Chromium". Regulatory Toxicology and Pharmacology. 26 (1): S3–S7. doi:10.1006/rtph.1997.1132. ISSN 0273-2300. ^ Weckhuysen, Bert M; Schoonheydt, Robert A (1999). "Olefin polymerization over supported chromium oxide catalysts" (PDF). Catalysis Today. 51 (2): 215–221. doi:10.1016/S0920-5861(99)00046-2. ^ Twigg, MVE (1989). "The Water-Gas Shift Reaction". Catalyst Handbook. ISBN 978-0-7234-0857-4. ^ Rhodes, C; Hutchings, GJ; Ward, AM (1995). "Water-gas shift reaction: Finding the mechanistic boundary". Catalysis Today. 23: 43–58. doi:10.1016/0920-5861(94)00135-O. ^ Mallinson, John C. (1993). "Chromium Dioxide". The foundations of magnetic recording. Academic Press. p. 32. ISBN 978-0-12-466626-9. ^ Garverick, Linda (1994). Corrosion in the Petrochemical Industry. ASM International. ISBN 978-0-87170-505-1. ^ Toshiro Doi; Ioan D. Marinescu; Syuhei Kurokawa (30 November 2011). Advances in CMP Polishing Technologies. William Andrew. pp. 60–. ISBN 978-1-4377-7860-1. ^ Baral, Anil; Engelken, Robert D. (2002). "Chromium-based regulations and greening in metal finishing industries in the USA". Environmental Science & Policy. 5 (2): 121–133. doi:10.1016/S1462-9011(02)00028-X. ^ Roth, Alexander (1994). Vacuum Sealing Techniques. Springer Science & Business Media. pp. 118–. ISBN 978-1-56396-259-2. ^ Shahid Ul-Islam (18 July 2017). Plant-Based Natural Products: Derivatives and Applications. Wiley. pp. 74–. ISBN 978-1-119-42388-1. ^ Vincent, JB (2013). "Chapter 6. Chromium: Is It Essential, Pharmacologically Relevant, or Toxic?". In Astrid Sigel; Helmut Sigel; Roland KO Sigel. Interrelations between Essential Metal Ions and Human Diseases. Metal Ions in Life Sciences. 13. Springer. pp. 171–198. doi:10.1007/978-94-007-7500-8_6. ISBN 978-94-007-7499-5. PMID 24470092. ^ Maret, Wolfgang (2019). "Chapter 9. Chromium Supplementation in Human Health, Metabolic Syndrome, and Diabetes". In Sigel, Astrid; Freisinger, Eva; Sigel, Roland K. O.; Carver, Peggy L. Essential Metals in Medicine:Therapeutic Use and Toxicity of Metal Ions in the Clinic. Metal Ions in Life Sciences. 19. Berlin: de Gruyter GmbH. pp. 231–251. doi:10.1515/9783110527872-015. ISBN 978-3-11-052691-2. ^ European Food Safety Authority (2014). "Scientific Opinion on Dietary Reference Values for chromium". EFSA Journal. 12 (10): 3845. doi:10.2903/j.efsa.2014.3845. ^ Di Bona KR, Love S, Rhodes NR, McAdory D, Sinha SH, Kern N, Kent J, Strickland J, Wilson A, Beaird J, Ramage J, Rasco JF, Vincent JB (2011). "Chromium is not an essential trace element for mammals: effects of a "low-chromium" diet". J Biol Inorg Chem. 16 (3): 381–390. doi:10.1007/s00775-010-0734-y. PMID 21086001. ^ Wise, SS; Wise, JP, Sr (2012). "Chromium and genomic stability". Mutation Research/Fundamental and Molecular Mechanisms of Mutagenesis. 733 (1–2): 78–82. doi:10.1016/j.mrfmmm.2011.12.002. PMC 4138963. PMID 22192535. ^ "ToxFAQs: Chromium". Agency for Toxic Substances & Disease Registry, Centers for Disease Control and Prevention. Feb 2001. Archived from the original on 8 July 2014. Retrieved 2 October 2007. ^ Vincent, JB (2015). "Is the Pharmacological Mode of Action of Chromium(III) as a Second Messenger?". Biological Trace Element Research. 166 (1): 7–12. doi:10.1007/s12011-015-0231-9. PMID 25595680. ^ a b Thor, MY; Harnack, L; King, D; Jasthi, B; Pettit, J (2011). "Evaluation of the comprehensiveness and reliability of the chromium composition of foods in the literature". Journal of Food Composition Analysis. 24 (8): 1147–1152. doi:10.1016/j.jfca.2011.04.006. PMC 3467697. PMID 23066174. ^ Kamerud KL; Hobbie KA; Anderson KA (2013). "Stainless steel leaches nickel and chromium into foods during cooking". Journal of Agric Food Chemistry. 61 (39): 9495–9501. doi:10.1021/jf402400v. PMC 4284091. PMID 23984718. ^ Flint GN; Packirisamy S (1997). "Purity of food cooked in stainless steel utensils". Food Addit Contam. 14 (2): 115–126. doi:10.1080/02652039709374506. PMID 9102344. ^ a b "Chromium". Nutrient Reference Values for Australia and New Zealand. 2014. Retrieved 4 October 2018. ^ a b "Nutrient Requirements and Recommended Dietary Allowances for Indians: A Report of the Expert Group of the Indian Council of Medical Research. pp.283-295 (2009)" (PDF). Archived from the original (PDF) on 15 June 2016. Retrieved 3 October 2018. ^ a b "DRIs for Chromium (μg/day)" (PDF). Overview of Dietary Reference Intakes for Japanese. 2015. p. 41. Retrieved 4 October 2018. ^ a b c "Chromium. IN: Dietary Reference Intakes for Vitamin A, Vitamin K, Arsenic, Boron, Chromium, Chromium, Iodine, Iron, Manganese, Molybdenum, Nickel, Silicon, Vanadium, and Chromium". Institute of Medicine (U.S.) Panel on Micronutrients, National Academy Press. 2001. pp. 197–223. Retrieved 3 October 2018. ^ a b "Overview on Dietary Reference Values for the EU population as derived by the EFSA Panel on Dietetic Products, Nutrition and Allergies" (PDF). 2017. ^ "Changes to the Nutrition Facts Label - Compliance Date". U.S. Food and Drug Administration. 2018. Retrieved 16 October 2018. ^ "USDA Food Composition Databases". United States Department of Agriculture Agricultural Research Service. April 2018. Retrieved 4 October 2018. ^ Kumpulainen, JT (1992). "Chromium content of foods and diets". Biological Trace Element Research. 32 (1–3): 9–18. doi:10.1007/BF02784582. PMID 1375091. ^ Grijalva Haro, MI; Ballesteros Vázquez, MN; Cabrera Pacheco, RM (2001). "Chromium content in foods and dietary intake estimation in the Northwest of Mexico". Arch Latinoam Nutr (in Spanish). 51 (1): 105–110. PMID 11515227. ^ a b Kantor, Elizabeth D; Rehm, Colin D; Du, Mengmeng; White, Emily; Giovannucci, Edward L (11 October 2017). "Trends in Dietary Supplement Use Among US Adults From 1999-2012". JAMA. 316 (14): 1464–1474. doi:10.1001/jama.2016.14403. PMC 5540241. PMID 27727382. ^ a b Stehle, P; Stoffel-Wagner, B; Kuh, KS (6 April 2014). "Parenteral trace element provision: recent clinical research and practical conclusions". European Journal of Clinical Nutrition. 70 (8): 886–893. doi:10.1038/ejcn.2016.53. PMC 5399133. PMID 27049031. ^ Finch, Carolyn Weiglein (February 2015). "Review of trace mineral requirements for preterm infants: What are the current recommendations for clinical practice?". Nutrition in Clinical Practice. 30 (1): 44–58. doi:10.1177/0884533614563353. PMID 25527182. ^ a b Vincent, John B (2010). "Chromium: Celebrating 50 years as an essential element?". Dalton Transactions. 39 (16): 3787–3794. doi:10.1039/B920480F. PMID 20372701. ^ FDA Qualified Health Claims: Letters of Enforcement Discretion, Letters of Denial U.S. Food and Drug Administration, Docket #2004Q-0144 (August 2005). ^ "Monograph: Chromium (from Chromium picolinate)". Health Canada. 9 December 2009. Retrieved 18 October 2018. ^ a b Scientific Opinion on the substantiation of health claims related to chromium and contribution to normal macronutrient metabolism (ID 260, 401, 4665, 4666, 4667), maintenance of normal blood glucose concentrations (ID 262, 4667), contribution to the maintenance or achievement of a normal body weight (ID 339, 4665, 4666), and reduction of tiredness and fatigue (ID 261) pursuant to Article 13(1) of Regulation (EC) No 1924/2006 European Food Safety Authority EFSA J 2010;8(10)1732. ^ San Mauro-Martin I, Ruiz-León AM, Camina-Martín MA, Garicano-Vilar E, Collado-Yurrita L, Mateo-Silleras B, Redondo P (2016). "[Chromium supplementation in patients with type 2 diabetes and high risk of type 2 diabetes: a meta-analysis of randomized controlled trials]". Nutr Hosp (in Spanish). 33 (1): 27. doi:10.20960/nh.v33i1.27 (inactive 2019-03-09). PMID 27019254. ^ Abdollahi, M; Farshchi, A; Nikfar, S; Seyedifar, M (2013). "Effect of chromium on glucose and lipid profiles in patients with type 2 diabetes; a meta-analysis review of randomized trials". J Pharm Pharm Sci. 16 (1): 99–114. doi:10.18433/J3G022. PMID 23683609. ^ Suksomboon, N; Poolsup, N; Yuwanakorn, A (17 March 2013). "Systematic review and meta-analysis of the efficacy and safety of chromium supplementation in diabetes". J Clin Pharm Ther. 39 (3): 292–306. doi:10.1111/jcpt.12147. PMID 24635480. ^ Bailey, Christopher H (January 2014). "Improved meta-analytic methods show no effect of chromium supplements on fasting glucose". Biol Trace Elem Res. 157 (1): 1–8. doi:10.1007/s12011-013-9863-9. PMID 24293356. ^ Costello, Rebecca B; Dwyer, Johanna T; Bailey, Regan L (30 May 2016). "Chromium supplements for glycemic control in type 2 diabetes: limited evidence of effectiveness". Nutrition Reviews. 74 (7): 455–468. doi:10.1093/nutrit/nuw011. PMC 5009459. PMID 27261273. ^ a b Tian, Honglian; Guo, Xiaohu; Wang, Xiyu; He, Zhiyun; Sun, Rao; Ge, Sai; Zhang, Zongjiu (2013). "Chromium picolinate supplementation for overweight or obese adults". Cochrane Database Syst Rev (11): CD010063. doi:10.1002/14651858.CD010063.pub2. PMID 24293292. ^ a b Onakpoya, I; Posadzki, P; Ernst, E (2013). "Chromium supplementation in overweight and obesity: a systematic review and meta-analysis of randomized clinical trials". Obes Rev. 14 (6): 496–507. doi:10.1111/obr.12026. PMID 23495911. ^ Lefavi RG, Anderson RA, Keith RE, Wilson GD, McMillan JL, Stone MH (1992). "Efficacy of chromium supplementation in athletes: emphasis on anabolism". Int J Sport Nutr. 2 (2): 111–122. doi:10.1123/ijsn.2.2.111. PMID 1299487. ^ Vincent JB (2003). "The potential value and toxicity of chromium picolinate as a nutritional supplement, weight loss agent and muscle development agent". Sports Med. 33 (3): 213–230. doi:10.2165/00007256-200333030-00004. PMID 12656641. ^ Jenkinson DM, Harbert AJ (2008). "Supplements and sports". Am Fam Physician. 78 (9): 1039–1046. PMID 19007050. ^ Maughan RJ, Burke LM, et al. (2018). "IOC Consensus Statement: Dietary Supplements and the High-Performance Athlete". Int J Sport Nutr Exerc Metab. 28 (2): 104–125. doi:10.1123/ijsnem.2018-0020. PMID 29589768. ^ Islam MM, Karim MR, Zheng X, Li X (2018). "Heavy Metal and Metalloid Pollution of Soil, Water and Foods in Bangladesh: A Critical Review". Int J Environ Res Public Health. 15 (12): 2825. doi:10.3390/ijerph15122825. PMID 30544988. ^ a b Bakshi A, Panigrahi AK (2018). "A comprehensive review on chromium induced alterations in fresh water fishes". Toxicol Rep. 5: 440–447. doi:10.1016/j.toxrep.2018.03.007. PMC 5977408. PMID 29854615. ^ Ahmed AR, Jha AN, Davies SJ (2012). "The efficacy of chromium as a growth enhancer for mirror carp (Cyprinus carpio L): an integrated study using biochemical, genetic, and histological responses". Biol Trace Elem Res. 148 (2): 187–197. doi:10.1007/s12011-012-9354-4. PMID 22351105. ^ Barceloux, Donald G; Barceloux, Donald (1999). "Chromium". Clinical Toxicology. 37 (2): 173–194. doi:10.1081/CLT-100102418. PMID 10382554. ^ a b Katz, SA; Salem, H (1992). "The toxicology of chromium with respect to its chemical speciation: A review". Journal of Applied Toxicology. 13 (3): 217–224. doi:10.1002/jat.2550130314. PMID 8326093. ^ Eastmond, DA; MacGregor, JT; Slesinski, RS (2008). "Trivalent Chromium: Assessing the Genotoxic Risk of an Essential Trace Element and Widely Used Human and Animal Nutritional Supplement". Critical Reviews in Toxicology. 38 (3): 173–190. doi:10.1080/10408440701845401. PMID 18324515. ^ NIOSH Pocket Guide to Chemical Hazards. "#0141". National Institute for Occupational Safety and Health (NIOSH). ^ Dayan, AD; Paine, AJ (2001). "Mechanisms of chromium toxicity, carcinogenicity and allergenicity: Review of the literature from 1985 to 2000". Human & Experimental Toxicology. 20 (9): 439–451. doi:10.1191/096032701682693062. PMID 11776406. ^ Newman, D. (1890). "A case of adeno-carcinoma of the left inferior turbinated body, and perforation of the nasal septum, in the person of a worker in chrome pigments". Glasgow Medical Journal. 33: 469–470. ^ Langard, S (1990). "One Hundred Years of Chromium and Cancer: A Review of Epidemiological Evidence and Selected Case Reports". American Journal of Industrial Medicine. 17 (2): 189–214. doi:10.1002/ajim.4700170205. PMID 2405656. ^ Cohen, MD; Kargacin, B; Klein, CB; Costa, M (1993). "Mechanisms of chromium carcinogenicity and toxicity". Critical Reviews in Toxicology. 23 (3): 255–281. doi:10.3109/10408449309105012. PMID 8260068. ^ Methods to Develop Inhalation Cancer Risk Estimates for Chromium and Nickel Compounds. Research Triangle Park, NC: U.S. Environmental Protection Agency, Office of Air Quality Planning and Standards, Health and Environmental Impacts Division. 2011. Retrieved 19 March 2015. ^ Ngan, V (2002). "Chrome Allergy". DermNet NZ. ^ Basketter, David; Horev, L; Slodovnik, D; Merimes, S; Trattner, A; Ingber, A (2000). "Investigation of the threshold for allergic reactivity to chromium". Contact Dermatitis. 44 (2): 70–74. doi:10.1034/j.1600-0536.2001.440202.x. PMID 11205406. ^ Baselt, Randall C (2008). Disposition of Toxic Drugs and Chemicals in Man (8th ed.). Foster City: Biomedical Publications. pp. 305–307. ISBN 978-0-9626523-7-0. ^ "US water has large amounts of likely carcinogen: study". Yahoo News. 19 December 2010. Archived from the original on 23 December 2010. Retrieved 19 December 2010. Wikimedia Commons has media related to Chromium. Look up chromium in Wiktionary, the free dictionary. IARC Monograph "Chromium and Chromium compounds"
"Chromium" . Encyclopædia Britannica. 6 (11th ed.). 1911. pp. 296–298.